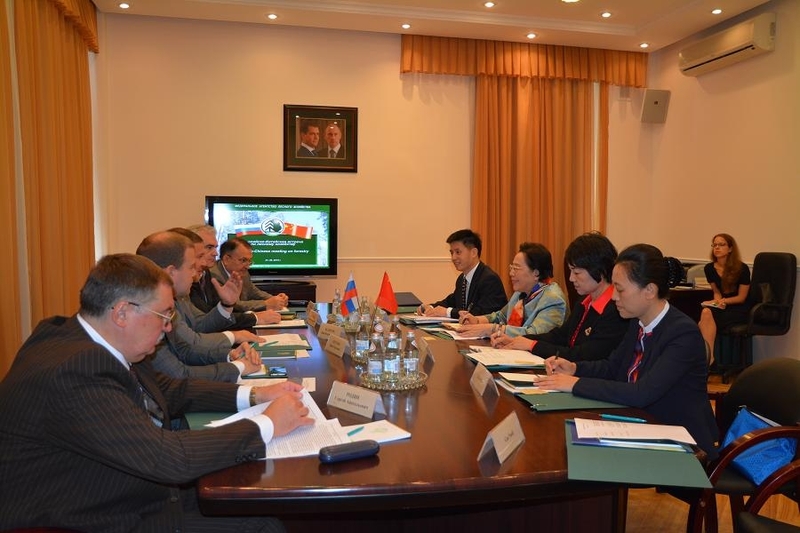 On August 21st, 2015, Prof.Jiang Zehui, the Vice Chair of CPPCC Committee of Population, Resources and Environment, Co-chairperson of the Board of International Network for Bamboo and Rattan (INBAR), Director General of International Centre for Bamboo and Rattan (ICBR), met Ivan Valentik, Deputy Minister of the Russian Ministry of Natural Resources and Director General of Federal Forest Service. Valentik warmly welcomed the delegation and introduced the key work of Russian Forest Service in recent years. He also expressed that China and Russian have achieved fruitful results in the forest field, and the two sides should continue a more in-depth cooperation in key areas of forest fire prevention, resources cultivating, forest pest control and forest young talents cultivation. Valentik formally invited Director Jiang Zehui to be the judge of the 12th International Teenager Forestry Competition in Moscow in mid-to-end September. Director Jiang Zehui extended her gratitude to Valentik, for meeting the delegation while he is busy working and for inviting her to be the judge for the Competition. She highly appreciated Russian Federal Forest Service for holding the International Teenager Forestry Competition every year to promote communication among teenagers of different countries and increase conscientiousness of ecology protection. Jiang also focused on presenting the general information of International Network for Bamboo and Rattan (INBAR). As an international inter-governmental organization headquartered in China, it is committed to promoting the sustainable use of bamboo and rattan resources, improving their social, economic and environmental efficiency and contributing to the millennium goals of the United Nations like eliminating poverty and protecting the environment. Jiang said that among the BRICS countries, currently only India and China are the members of INBAR. We are inviting Brazil and South Africa and especially expecting Russia to join the organization so that we can together exert a positive influence and make contribution to globally eliminate poverty, protect the environment and promote green development. Although Russia is not a bamboo or rattan producer, goods like bamboo and rattan furniture and floor as well as their woven products are more and more popular among the Russian. As a future important bamboo and rattan products consumer country, it is hoped that Russia give attention and support to the INBAR’s development. Ivan Valentik praised INBAR’s important function and contribution, expressing to communicate with Russian Ministry of Foreign Affairs for positively considering China’s invitation of joining IINBAR. Zhang Hongyan, Deputy Director General of the Department of International Cooperation of China State Forestry Adminstration and Li Xiaohua, deputy Director General of ICBR attended the meeting. They also conducted work level communication with related Russian departments about the eighth forestry working group meeting between China and Russia and topics like China participating International Teenager Forestry Competition.